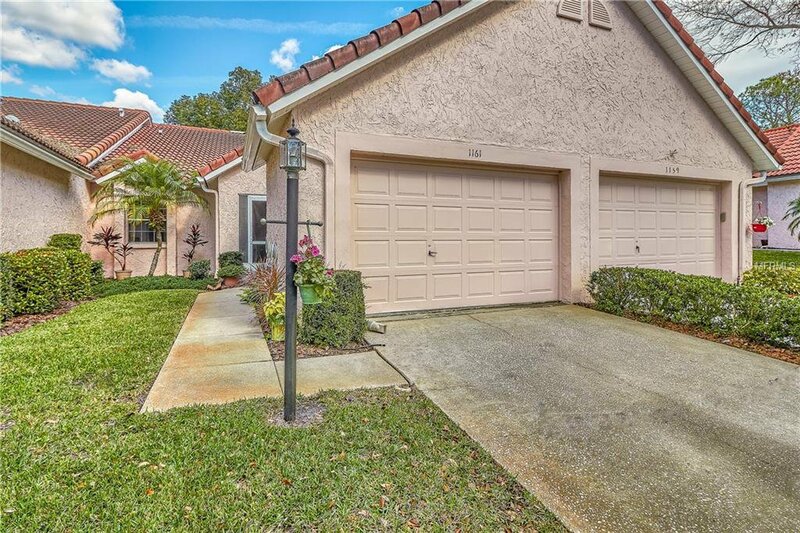 Understated elegance marks this substantially remodeled 2 bed 2 bath, Golfview Villa 2, spit floor plan unit in Highland Lakes, a premier 55+ Golf community. Eat-in kitchen has SS appliances, convection oven, and granite countertops with pass through to Great Room. Upgraded Mannington antique restoration collection water-resistant plank flooring in four main areas and carpet (in bedrooms and den), newer baseboards throughout, and GE whole house water softener system. Fresh interior paint and flooring in grey tones. Entrance is private and inviting with a screened in lanai area. Richly landscaped back patio overlooks the golf course and contains a large green space area. Oversized garage accommodates a golf cart and a vehicle. 2017 updated electrical panel, 2015 Trane high efficiency AC. Hurricane shutters for main exposure windows in back of villa. To be sold partially furnished. The low master HOA Fee of $108 includes Golf Membership for 2 with No Greens Fees, 27 Hole Course, 2 Community pools, 4 courts for Tennis & Pickle ball, Shuffleboard, Main Clubhouse with Auditorium, Library w/Computers & Meeting rooms; Performing Arts; Lake Lodge; Boat Access to Lake Tarpon; RV & Boat Storage, Arts, Crafts & Clubs. Make your appointment today. Listing courtesy of DALTON WADE INC.. Selling Office: RE/MAX REALTEC GROUP INC.